We were so excited to be first time participants in the Lafayette Garden Tour on June 1, 2013! Our fabulous dental team sweated tilling and planting together for hours to make our garden dream a reality. What a great team building project, and I am thankful every day for the special women making up my dental team! We chose a mix of annuals for immediate eye candy and perennials that would grow and mature over the years. As patients walk up the front entrance path at Complete Family Dentisty, we hope the garden welcomes them with a cozy, cottage feel. As the years pass, we hope to continue participating in the Old Town Lafayette Garden Tour to show off our progress! We especially loved the fabulous write up in the brochure by Vicki Uhland and the beautiful design by Annette Thull. 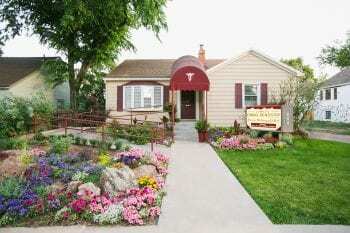 Thank you to the fabulous Stephanie Brauer for photographing our new garden at Complete Family and Aesthetic Dentistry!